I don't have a great many pictures to show since many of the pens are sold shortly after being made and most of the glass work is installed in homes. The pens shown below have been turned and finished in the last few days to give an idea of styles and different materials. Most of the pens or pencils are sold directly through e-mail where buyers indicate both the pen style and the preferred kind of wood or man-made material. They also are sometimes sold through E-Bay although that is not currently the case since my teaching schedule precludes spending sufficient structured time to monitor the sales and make sure everything is promptly shipped. This is a sample of the approximately 25 pen styles I make from over 75 species of wood and man-made materials. All of the pens are hand-crafted to my high personal standards; they are "sanded" to a minimum of 12,000 grit with about 20 interim steps and receive multiple coats of finish which can be shellac and wax or a special lacquer like product depending upon the nature of the wood. Acrylics are wet-sanded to 12,000 grit and then polished with special plastic polish until they develop a deep shine. 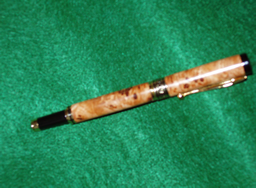 This is a straight sided roller ball made from a nice piece of maple burl wood--the cap snaps on to cover the roller ball pen tip and snaps on the back of the pen when writing. Medium sized barrel and a traditional style. 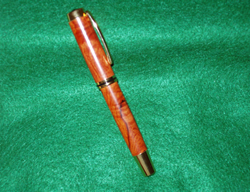 These pens sell for $30.00 - $40.00 depending on the wood. This is not a pen for the faint of heart! It is larger than most pens, but balances beautifully since the screw-on cap does not attach to the back when the fountain pen point is exposed. It is more suited to desk usage than being carried in a pocket. Shown on the left is a particularly nice piece of figured Afzelia wood with 10K Gold fittings. The one on the right is black acrylic with white streaks and platinum fittings. This particular pen will sell for approximately $60.00 - $75.00 depending on the desired wood and whether it is made with the gold or the platinum fittings. It can be done as a fountain pen or a roller ball pen. This a smaller version of the large pen above. This particular pen has a German made fountain pen tip although it can also be made with a roller ball point. The cap screws on the back when not covering the tip so it balances very nicely when writing. A smaller size and the wood is Bocote with 10K fittings. These pens sell for $40.00 - $50.00 and can be done with either gold or platinum fittings. This is my personal daily use favorite. 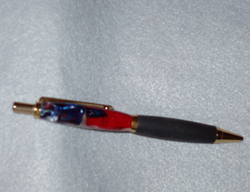 The pen shown is acrylic (the blend is called "Old Glory") with a soft rubber front barrel which is large enough to hold comfortably for an extended time. Fittings are 24K Gold and the refill is a Parker so I usually replace the ballpoint refill with a Parker Gel refill since it writes more smoothly. 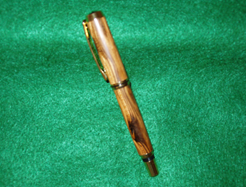 These pens are available for $20.00 -$25.00 since it uses less wood and comes only with gold fittings. This is a nice size to carry in a shirt pocket without being so small that it is uncomfortable to write with for an extended time. 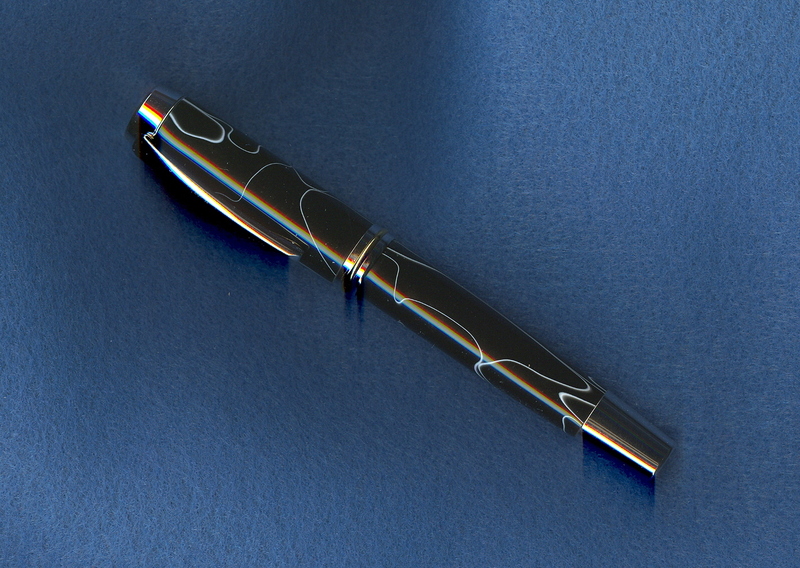 This pen is made from acrylic with "platinum" fittings which are actually rhodium and extremely durable. The fittings appear as a shiny silver, but do not tarnish or scratch with daily usage like the gold fittings. These pens are also in the $25.00 range and can be made either with the gold or platinum fittings. I can also put a short rubber grip on the front barrel which makes it easier to hold for extended use.